Tripp Lite's SmartRack SRXFANROOF is ideal for increasing the ventilation in all rack enclosure server cabinets. 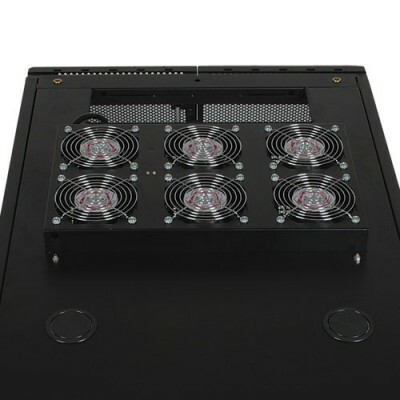 The unit features (6) 208-240V high performance fans mounted in a roof panel, and includes toolless mounting hardware. Built-in cable access holes for routing of cables through fan roof panel. Supports 208-240V 50/60 Hz AC input. COMPATIBLE SMARTRACK ENCLOSURES - SR25UB, SR25UBKD, SR25UBSP1, SR25UBTAA, SR42UB, SR42UBCL, SR42UBEXP, SR42UBG, SR42UBKD, SR42UBSP1, SR42UBTAA, SR48UB, SR48UBCL, SR48UBEXP, SR48UBSP1, SR42UBTAA, and other Tripp Lite SmartRack enclosures that specify the use of this accessory.